Dr. Valaskakis, Ambassador of Canada (Ret.) 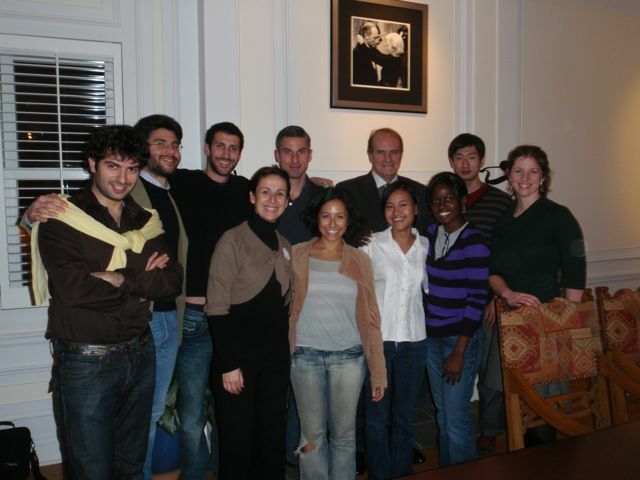 and President, Club of Athens Global Governance Group, came to speak at Sauvé House on December 2, 2008 on “Hypercapitalism”. Before delving into the subject matter, a few words on our guest’s multifaceted and fascinating career, which spans four different but converging streams. Holding a PhD in Economics from Cornell University and a French Law degree, Dr. Valaskakis is an academic by trade with thirty years of teaching in Canada and Europe under his belt. He has also been an executive at the helm of the Gamma Institute, an international think tank specialized in forecasting and planning studies. The third stream of his career is consulting; he held the position of Chairman of Isogroup Consultants, an international strategy firm preparing plans for major multinational firms. Finally, Dr. Valaskakis has served as Canada’s Ambassador to the Organization for Economic Cooperation and Development (OECD) in Paris. Dr. Valaskakis introduced his presentation suggesting that the 2008 World Crisis was not only financial or economic in nature but rather a systemic phenomenon caused by Hypercapitalism for the solution of which, a systemic response was needed. Dr. Valaskakis identified Hypercapitalism as one of several models of society (Communist, French Social Democracy, Swedish, Cuban, etc.) at the date of its inception around 1980. From then onwards, Hypercapitalism has become the dominant economic model with two very distinct features: the retreat of governments; the dominance of non-state actors such as multinationals, special interest groups and non-governmental organizations; and the lack of a regulatory framework to oversee this ever-closer global interconnection, which is what has ultimately led to its collapse. The five main tenets of the Reagan-Thatcher Revolution – deregulation, privatization, smaller government, reduction of welfare state, global free trade – are being reversed in an historic turning point that sees the return of massive state intervention. At a moment when stimulus packages now give immense power to governments, there is a renewed requirement for democratic control of governments since national governments are now in the position to control foreign banks. State intervention can be seen not only in the resurgence of the welfare state with Universal Health Care now a US priority, but also with government sponsored bailouts for big corporations (Corpfare). In trying to provide an answer to what comes after Hypercapitalism, Dr. Valaskakis suggested that there could be four scenarios: socialism, state capitalism, global capitalism with soft regulation, and global capitalism with strong regulation. Due to the global nature of the crisis, Dr. Valaskakis advocates the development of a new paradigm that features solutions simultaneously meeting the challenges of Economics, Climate Change and Global Security, an unprecedented mobilization of Global Actors and the creation of implementable action plans. After his presentation, Dr. Valaskakis, answered numerous questions from the Scholars and continued to satisfy their intellectual curiosity and hunger for thought-provoking dialogue during the reception that followed.